TAIPEI, Taiwan — The head of Foxconn Technology Group, having announced plans to step away from day-to-day operations at the world’s largest electronics provider, said Tuesday that he is mulling a run for president of Taiwan. Terry Gou said he would make a decision “in a day or two” on a possible presidential bid, according to Taiwan’s official Central News Agency. He said that if he decided to run, he would take part in the opposition Nationalist Party primary rather than mount an independent bid. The Nationalists favor closer ties with Beijing, a policy that accords with Gou’s massive business interests in China. Any candidate is expected to face a crowded field in the 2020 polls, in which President Tsai Ing-wen of the pro-independence Democratic Progressive Party says she will seek a second four-year term. “The major direction of the company will still be guided by me. 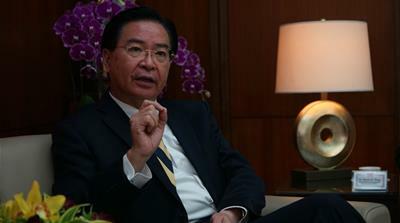 But I will gradually step back from the front-line operations,” the 69-year-old Gou said. Foxconn earlier this year cited a changing global market as requiring a move away from making LCD panels in Wisconsin. Apple is Foxconn’s main manufacturing customer and it has forecast a drop in revenue from the Chinese market due to decreasing demand for iPhones. In a speech marking 40 years since the start of improving ties, he reiterated Beijing’s call for peaceful unification on a one-country-two-systems basis. However, he also warned that China reserved the right to use force. While Taiwan is self-governed and de facto independent, it has never formally declared independence from the mainland. Beijing considers the island to be a breakaway province and Mr Xi’s comments are in line with China’s long-standing policy towards reunification. But on Wednesday, Taiwan’s President Tsai Ing-wen said the island would never accept reunification with China under the terms offered by Beijing. Under the “one country, two systems” formula, Taiwan would have the right to run its own affairs; a similar arrangement is used in Hong Kong. Hong Kong has its own legal system, and rights including freedom of assembly and free speech are protected – however, there are widespread concerns in the territory that those freedoms are gradually being eroded. What’s behind the China-Taiwan divide? In his speech on Wednesday, Mr Xi said both sides were part of the same Chinese family and that Taiwanese independence was “an adverse current from history and a dead end”. Taiwanese people “must understand that independence will only bring hardship,” Mr Xi said, adding Beijing would never tolerate any form of activity promoting Taiwanese independence. Instead, unification was “an inevitable requirement for the great rejuvenation of the Chinese people”, he argued. He also stressed that relations with Taiwan were “part of China’s domestic politics” and that “foreign interference is intolerable”. Beijing “reserves the option of taking all necessary measures” against outside forces that interfere with peaceful reunification and Taiwanese separatist activities. What is the view in Taiwan? In a new year’s speech on Tuesday, Ms Tsai said China must use peaceful means to resolve its differences with Taiwan and respect its democratic values. “I would like to call on China to face squarely the reality of the existence of the Republic of China on Taiwan,” Ms Tsai said, referring to the island’s formal name. China should “respect the insistence of 23 million people on freedom and democracy, and must use peaceful, on parity means to handle our differences”, she added. In November, Ms Tsai’s political party saw a heavy setback in regional elections perceived by Beijing as a blow to her separatist stance. How serious is China’s threat? The Chinese Communist Party has long spoken about unification as a matter of destiny. But President Xi is arguably the most powerful leader since Mao – now unconstrained by presidential term limits – and one who has personalised, like no other, the project for “national rejuvenation”. So should we pay more heed when the threat to retake Taiwan by force if necessary comes from his lips? China may be a rising military superpower, but sending an invading army across the choppy, well-defended waters of the Taiwan strait would still be a huge military gamble, with success far from guaranteed. Beyond the slightly more strident tone, Mr Xi’s speech does not appear to signal any dramatic change in those calculations, especially when you take into account the more conciliatory passages offering a further strengthening of trade links. If there is to be any warfare, it is likely to be of the cyber kind; China is reported to be stepping up its efforts to influence Taiwan’s elections to hurt the prospects of independence-leaning parties and politicians. The hope has long been that it will be China’s growing economic might, not military force, that will eventually pull Taiwan into its embrace. Why is this so contentious? 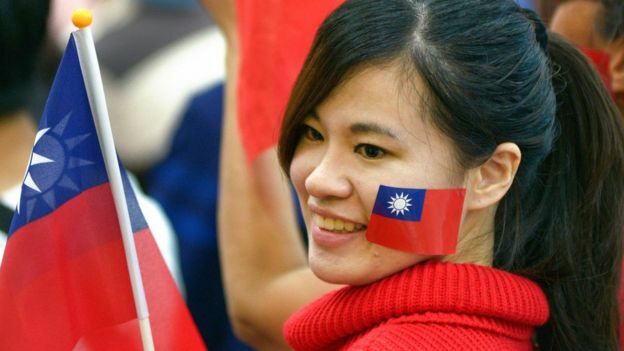 Taiwan is a self-governed democracy and for all practical purposes has acted as an independent nation since 1949, when China’s nationalist government was defeated by communist forces and fled there from the mainland. China however considers the island to be a breakaway province – not a country in its own right – which will one day be fully reunited with the mainland. In recent years, Beijing has become increasingly assertive over its claims and what it says is a key question of national sovereignty. China, for instance, insists that other countries can only have diplomatic ties with China or Taiwan, not both. Beijing has won over more and more of Taipei’s few international allies to cut diplomatic ties with the island and establish relations with China instead. Last year, it also forced foreign airlines and hotels to list Taiwan as part of China on their websites. Beijing is test-driving propaganda techniques ahead of Taiwan’s largest-ever elections on Saturday, officials say. 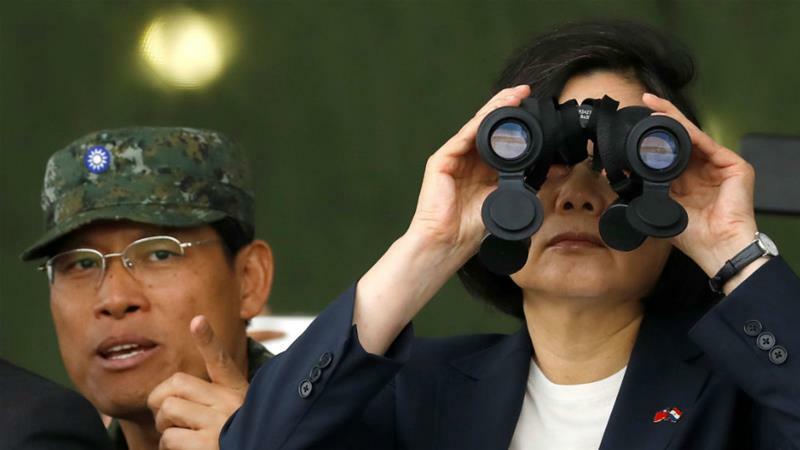 Taipei, Taiwan – China is spreading “fake news” via social media to swing Taiwanese voters away from President Tsai Ing-wen’s party and behind candidates more sympathetic to Beijing ahead of elections, Taiwanese officials said. Beijing is test-driving its techniques in Taiwan, where it has a big stake in the politics and understands the language and culture, but deployed its cyber-capacities in the United States, Australia and other democracies, the officials said. “We received propaganda warfare coming from China for years, but this is taking a very different form,” Foreign Minister Joseph Wu, from Tsai’s ruling Democratic Progressive Party (DPP), told Al Jazeera. Comments from Wu and other DPP officials are in line with growing global fears that authoritarian China, like Russia, is meddling in foreign elections. Last month, US Vice President Mike Pence said Moscow’s effort “pales in comparison” to interference from Beijing. Beijing’s mission to the UN did not respond to Al Jazeera’s interview request, but Chinese officials have previously rejected such claims as “confusing right and wrong and creating something out of thin air”. Taiwanese voters go to the polls on Saturday to choose mayors and others in midterm elections that will reflect the popularity of the anti-Beijing DPP and Tsai, who is expected to seek re-election in 2020. It will be Taiwan’s largest election ever with about 19 million voters, or 83 percent of the population, casting ballots for more than 11,000 officials. False stories can be traced to foreign servers and back to the Chinese Communist Party (CCP) and it’s so-called “50 Cent Army” of online trolls and commentators, DPP politician Lo Chi-cheng told Al Jazeera. They typically undermine Tsai, the DPP or Taiwan’s autonomy from the mainland, while stirring up historic grievances by which some voters support the DPP and others back its main rival, the pro-Beijing Kuomintang (KMT). “The US, Australia, Germany and other countries are also addressing the issue as to how countries like Russia and China use disinformation to influence domestic and electoral politics in democracies like Taiwan,” said Lo. One story suggested that Tsai was flanked by armed soldiers when visiting flood victims in Chiayi County in August. Another said some of Taiwan’s last-remaining allied governments were about to abandon Taipei. Another said China had bussed Taiwanese nationals to safety after typhoon Jebi killed 11 and injured thousands in Japan in September, and that Taipei had let its people down – a story that reportedly led to the suicide of a Taiwanese diplomat in Osaka. Ahead of voting, police arrested several suspects for malicious story-sharing but, for Wu, the focus is on Taiwan’s government to counter fake news with quick, factual corrections. For Lo, plans to tighten media laws are controversial as they could violate free speech rules. Not everyone fears Beijing’s media reach, however. Eric Huang, an independent analyst with links to the KMT, said Taiwan’s voters have high rates of internet penetration and are used to the subjective news in mainstream Taiwanese media. “Taiwanese news agencies are very editorial and opinionated along party lines already, so the people are used to biased news. They just view this information coming from China as entertainment,” Huang told Al Jazeera. Justin Yu, a technology investor in downtown Taipei, echoed these thoughts, saying younger Taiwanese web-users are well acquainted with the competing narratives from Taipei and Beijing. “When we were in elementary school, we were told we shouldn’t be so close to the Chinese government. Whenever we see the information, we hesitate and question whether it is real or not. I don’t think there’s a real problem and it doesn’t influence us much,” Yu told Al Jazeera. Since the 2016 election of Tsai’s pro-independence DPP, Beijing has turned the screws on Taiwan, peeling away a handful of its remaining diplomatic allies, excluding it from global forums, and forcing airlines to classify Taiwan as part of China. 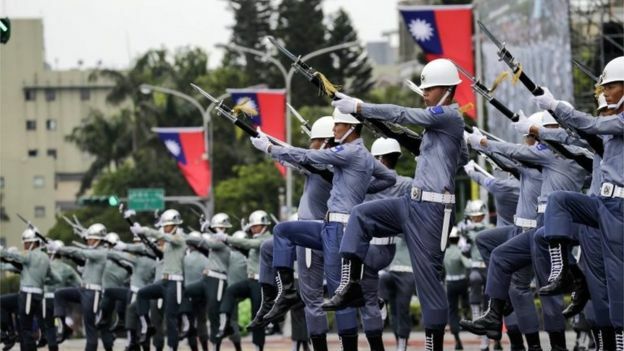 Three former allies – El Salvador, Dominican Republic and Burkina Faso – switched their allegiances to Beijing this year, and the Chinese military has stepped up encirclement drills around Taiwan, which Taipei has denounced as intimidation. According to DPP officials, Beijing has reached deep into the breakaway island of 23 million people, sowing division and confusion through online disinformation, recruiting business figures, and funnelling cash to pro-Beijing politicians. The Republic of China – Taiwan’s official name – relocated to the island in 1949 when Chiang Kai-shek’s nationalists fled the mainland after being defeated by Mao Zedong’s communists. It is now a democracy with de facto independence from Beijing. Under its “one China” policy, the Beijing regards Taiwan as a renegade province that needs to be unified – by military force if necessary. Many analysts say China seeks to achieve the same end by flooding Taiwan with investment and buying off decision-makers. The opposition KMT marks a continuation of Chiang’s legacy. DPP supporters typically highlight atrocities committed during Taiwan’s “white terror” and decades of martial law and call for independence from the mainland. Last month, thousands of pro-independence demonstrators rallied in Taiwan’s capital to protest against Beijing’s “bullying” and called for a referendum on whether the self-ruled island should formally split from China. South China Sea: The world’s next big war? This article to you tonight is one I have been thinking about writing for a couple of weeks but because of the length I knew it would be I have avoided taking the time to write it. First I want to let you know that I got a lot of the information for this article from the New York Times so I want to make sure to credit them. Also, a lot of this information is simply garnered from all of the years of taking history classes in high school and in college. There is another point that I want to make clear to folks about how I feel/believe about the “People’s Republic of China” or the ‘PRC.’ for the purpose of this article I will refer to the Communists murderers in Beijing as the rulers of the Mainland. My personal opinion and belief is that Taiwan’s government, the “Republic of China” is the real legal government of all of China, not just the Taiwan Island. The PRC is a leading member of the U.N., they also sit as one of the 5 permanent member seats of the Security Council. Up until 1950 the ROC was a founding member of the U.N. and had a seat on the Security Council. In 1950 the balless wonders at the U.N. not only removed the rightful government of the Chinese people from the Council they removed them as a member State and they demoted them to an “Observer State.” If you are a person who has not been paying attention to the blatant aggression of the PRC government through their President Xi Jinping, you need to, everyone on the planet does. The following is information on some of the reasons that I made that statement and is some of the reasons that I have decided to take the time to write this article to you. July 12th of 2016, the Communist government of Mainland China totally told the U.N. and the rest of the world to go F–k themselves. On that day the World Court which is through the U.N. made a ruling concerning the PRC’s blatant aggression in the South China Sea. The PRC was told to quit their activities of aggression toward their neighbors and the rest of the world. The Communist government of the Mainland told the U.N. and the World Court that they “did not recognize the authority of the U.N or of the World Court.” So, the question I have for you, and to the U.N. is, if they refuse to recognize the authority of the World Court and the U.N. then why in the bleep has the U.N. not removed these murderers both from the Security Council and from the U.N. itself? Why on earth would the balless wonders who run the U.N. allow the PRC to remain on the Security Council where they have Veto Power to cancel out all of the good things that the rest of the world is trying to accomplish? This makes no sense, it is totally stupid. The only thing that I can think of is, they are cowards! If the U.N. cared about the world in general they would remove the PRC from the Council, and reinstate the ROC (Republic Of China/Taiwan) to its rightful position in the U.N. and on the Security Council. Also, they should lower the PRC to the position that the ROC has now, only as an Observer State and if the PRC chooses to balk at that then they should be removed from the U.N. all together. July 12th, 2016. The International Tribunal at the Hague delivered a sweeping rebuke of the PRC and their actions in the South China Sea which includes the construction of artificial islands. The Court also ruled that their expansive claim to sovereignty over the air and sea has no legal basis. The PRC could have been and should have been named as an “International Outlaw.” This was the first time that the PRC has ever been summoned before the International Justice System. The PRC claims that they have “Historical rights over almost all of the South China Sea,” basically about 90% of it. The International Court disagrees and they sided with their neighbors who brought the suit against them. The International Court also said that the PRC violated International Law by causing “irreparable harm” to the marine environment, endangering Philippine ships and interfering with Philippine oil exploration. Globally the rulings of the International Court are binding but the problem is that there is no system in place to physically enforce the law. At the very least the U.N. does have the authority to require all UN member nations to totally and completely boycott all imports and exports into and out of the PRC Mainland. The PRC obviously knew that they were going to lose this court battle so they didn’t even bother to send a low-level representative to the Court. They also made it very clear to the U.N. before the litigation began that they would not abide by the Court’s ruling. The countries that brought the complaint to the Court were the Philippines, Brunei, Indonesia, Malaysia, Taiwan and Vietnam. Speaking at a meeting of European Leaders the PRC President Mr. Xi Jingping was defiant in his claims about them having sovereignty over the South China Sea since “Ancient Times.” Since the ruling the PRC has accelerated their aggression in the South China Sea trade routes, fishing waters as well as stealing the oil and other mineral rights of their neighboring. The PRC has built a large artificial island upon an atoll known as Mischief Reef. They have built a large military airstrip and Naval births there even thought the World Court ruled that this was in Philippine National waters. The PRC claims what they call the “nine-dash-line” which encircles 90% of the South China Sea, the area we are talking about here is equivalent to the size of Mexico. The Philippines had asked the International Court to rule against the PRC because the PRC is in violation of the U.N. Convention on the “Law Of The Sea” which both the PRC and the Philippines signed and ratified as being valid. The International Court also ruled that several disputed rocks and reefs in the South China Sea were too small to claim control of economic activities in the waters around them. As a result the Court ruled that the PRC was engaging in unlawful behaviour in the Philippines waters including activities that have made the dispute worse. This is no light matter, think about what the PRC is trying to do. They say they control all shipments of goods into and out of all of these Nations. They are saying that they control all air routes into and out of all of these Nations that would go into or over the South China Sea. If these illegal actions are not forcibly stopped right now the PRC will be able to totally control and or totally tank every Nation’s economy not just in the region but in the world. At the very least the PRC is quickly becoming capable of charging every ship and every plane a toll of their own chosen level, they can do anything they choose to any nation or people. The whole world, the U.N. must grow a set of Balls and stand up against the PRC in every possible way, right now, for if not, we will all soon be needing to learn how to speak Mandarin Chinese. If you have paid any attention the Communist PRC isn’t even the Legal Government Of China, the Legal Government is the ROC (Republic of China) which at this time resides on the Island of Taiwan. These mass murderers killed ten of millions of China’s people when they forced themselves onto the Mainland population. The first Leader of the PRC was Chairman Mao and during the 1950’s he murdered tens of millions if not a few hundred million of the Chinese people via starvation. You may ask, what that has to do with now and that is a fair question. The answer is that the President for life of the PRC, Mr. Xi Jinping is a devout student, believer and follower of Chairman Mao. Wake up world, grow some Balls U.N. or soon you will not exist any longer. The communist government that resides on the mainland is not the legal government of China! The Communists leadership which holds the billion plus people, civilians, men, women and children at the point of a gun is not the legal government of the Nation of China and they never have been, they are nothing but murderers and thieves. Archeologist tell us that there have been humans on the mainland for a little over two million years. The first Dynasties were the XIA, then the Shang, then the Zhou. The first unified government was during the Qin Dynasty and it was these people who sat up the position of Emperor. The Han Dynasty (206 B.C. through 220 A.D.) greatly expanded their territory through their military campaigns. Countries they took over were parts of Korea, Vietnam, Mongolia as well as punching out a strong foothold deep into central Asia. It is during this time frame that the Chinese government helped establish what became known as ‘the Silk Road’. In the year 1271 A.D. the 5th Khagan of the Mongols established the Yuan Dynasty, in 1368 it ended. In 1368 a peasant revolt led by a man named Zhu Yuanzhang ended the Mongol reign. At this time they sat up the Ming Dynasty which lasted until 1544. They established the Qing Dynasty and during that war it is believed that 25 million people were killed. The Quing Dynasty lasted until the year 1912 and they were the last Dynasty, up until a man named Xi Jinping assumed the office of President about six years ago. During the 1800’s the government of China took a defensive view toward Europe and their tendencies to colonise other Nations, this stunk of hypocrisy though being the Chinese government was doing the same exact thing themselves. Yet it is to the credit of the Chinese leaders of the early 19th century that they realized that there was a world that was much bigger than China and that they had no control of that reality. From 1851-1873 China and Great Britain fought two wars which became known as the Opium Wars. During these wars it is estimated that 200 million Chinese people died. On January 1st of 1912 the ‘Republic of China’ was established which ended a 2,000 year reign of Imperial Rulers. In 1937 Japan attacked the people of China and this war cost the Nation of China another ten million people before it ended in 1945. After WWII had ended the Communists took advantage of the weakened state of the legitimate government of China forcing a Civil War on the Nation. In 1947 the real government of China, the ROC, were able to set up Constitutional Rule but the Communists ignored the will of the people killing many millions more civilians until they were able to push the ROC Government onto the Island of Taiwan in 1949. The two sides kept fighting until 1950 though no Truce was ever signed. There are two things that I am going to leave you with tonight about the Communist mass murderers on the mainland, one is that the founder of modern-day Chinese Communist Party was Chairman Mao and he was directly responsible for the deaths of several hundred million of his own people. Two, President Xi Jinping is a devout follower of Chairman Mao. 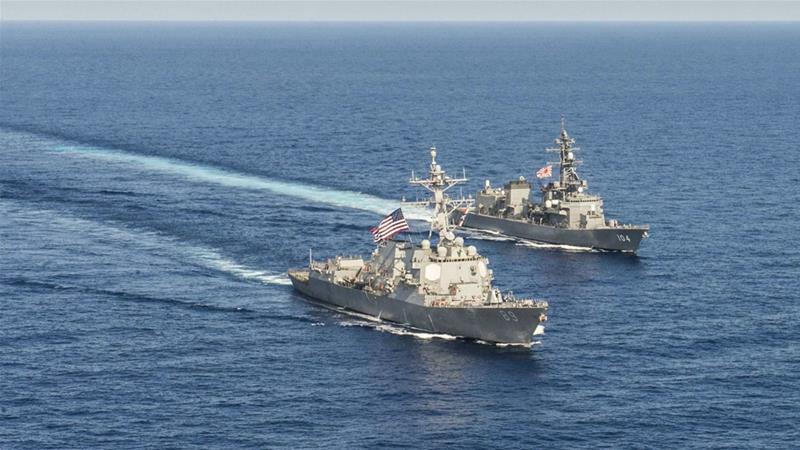 Two U.S. Navy warships sailed through the international waters of the Taiwan Strait on Monday, the body of water separating China and Taiwan, the island nation that China considers a breakaway province. The transit could increase tensions between the U.S. and China as both countries are involved in a trade dispute and as the U.S. voices concerns over China’s militarization of the South China Sea. A similar transit by two U.S. destroyers occurred in July, the first time the Navy had carried out a mission like that in more than a year. Taiwan’s Defense Ministry first confirmed the transit in a statement. “The Ministry of National Defense said today that two US ships have sailed from the south to the north through the Taiwan Strait,” said a translation of the statement. “The Ministry of National Defense pointed out that the US ship routinely passed the international waters of the Taiwan Strait, and the relevant details were explained by the US government,” it added. While the U.S. and China cooperate in denuclearizing North Korea, tensions have increased as both the U.S. and China have engaged in a trade war. There are also tensions between the two countries over China’s growing military presence on man-made islands in the Spratly Islands in the South China Sea. Earlier this month a Chinese Navy ship came within 45 yards of the U.S. Navy destroyer USS Decatur as it carried out a freedom of navigation passage through international waters close to those islands. Another irritant in the U.S.-China relationship continues to be U.S. support for Taiwan. The U.S. continues to sell military weapons to the island nation even though it does not have diplomatic relations with Taiwan. China maintains Taiwan is a breakaway province and not an independent nation. The derailed train in Yilan County, Taiwan, on Sunday. Beijing, China (CNN) At least 18 people were killed and 178 others injured when a train derailed in Yilan County in northeastern Taiwan, according to an update from the island’s transport ministry. Initially, the ministry said 22 people died, but it later revised the number. 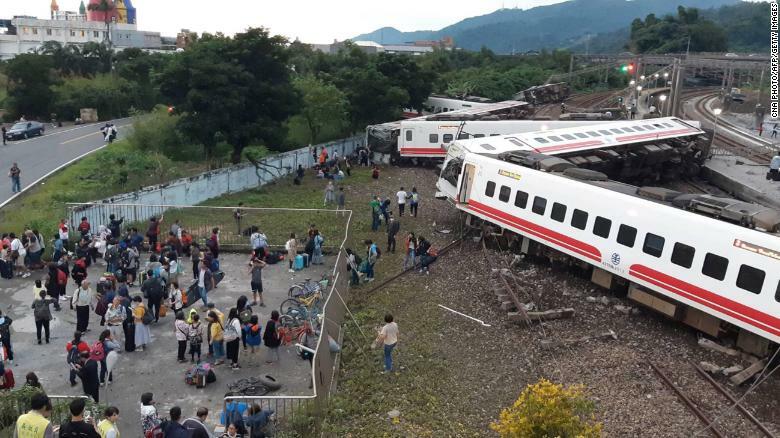 The train was traveling between the cities of Shulin and Taitung when it derailed Sunday on a coastal line reportedly popular with tourists. The train was carrying 366 passengers when the accident occurred just before 5 p.m. local time, the transport ministry said. All eight train carriages derailed in the incident, with five of those overturning, the ministry said. A 43-year-old American woman was among those injured, according to the ministry. She has been sent to a local hospital, which said she suffered bruises. The cause of the derailment is under investigation. Yong Xiong reported from Beijing; Sheena McKenzie wrote in London. Aerial of the Pentagon, the Department of Defense headquarters in Arlington, Virginia, near Washington DC, with I-395 freeway on the left, and the Air Force Memorial up middle. China has reacted with anger to the news that the United States is ready to approve a $330 million arms sale to neighboring Taiwan. The contract was confirmed in a Pentagon news release on Monday that detailed an inventory of spare parts and repairs to be bought from the U.S. for Taiwanese military aircraft. 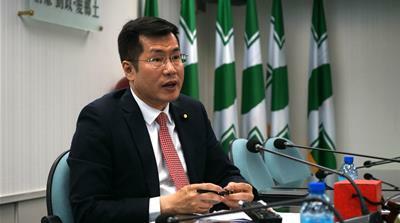 At a daily press conference on Tuesday, a spokesperson for the Chinese Foreign Ministry, Geng Shuang, expressed anger over the deal and said China had already made its feelings clear to U.S. representatives. Senior politicians in Beijing view Taiwan as a breakaway province that will eventually be reclaimed as part of the mainland. China has used its growing economic power to ask nations it trades with to accept this “one China” view. However, many Taiwanese want their island to be considered a separate nation and other global powers, including the United States, have wrestled with diplomatic language to try and satisfy both sides. Under Presidents George W. Bush and Barack Obama, military deals with Taiwan had become less frequent as Washington attempted to improve its relationship with Beijing. If approved by Congress, this latest sale would mark the second arms deal between Taiwan and the U.S. during the tenure of President Donald Trump. The first, and much bigger deal, was carried out in June 2017 when the U.S. agreed to sell missiles, torpedoes and an early warning system to Taiwan for $1.4 billion. At that time, a Chinese ambassador said the deal damaged trust between Trump and Chinese President Xi Jinping. President Donald Trump and China’s President Xi Jinping shake hands at a press conference following their meeting outside the Great Hall of the People in Beijing last November. Relations between Trump and Xi are already under severe strain thanks to an ongoing trade war between the two countries. On Tuesday, China released a paper that accused the U.S. of “trade bullyism practices.” The Trump administration levied tariffs on an additional $200 billion of Chinese goods on Monday, while Beijing retaliated by targeting roughly $60 billion worth of U.S. imports.